« More: Have colleges watered down their curriculums? The ACTA maintains a web site – aptly called “What will they learn?” – that provides access to the school-by-school data. It’s easy to navigate to a specific school; simply click the “Compare Schools” tab … then find your school of interest. First, there is some general information. 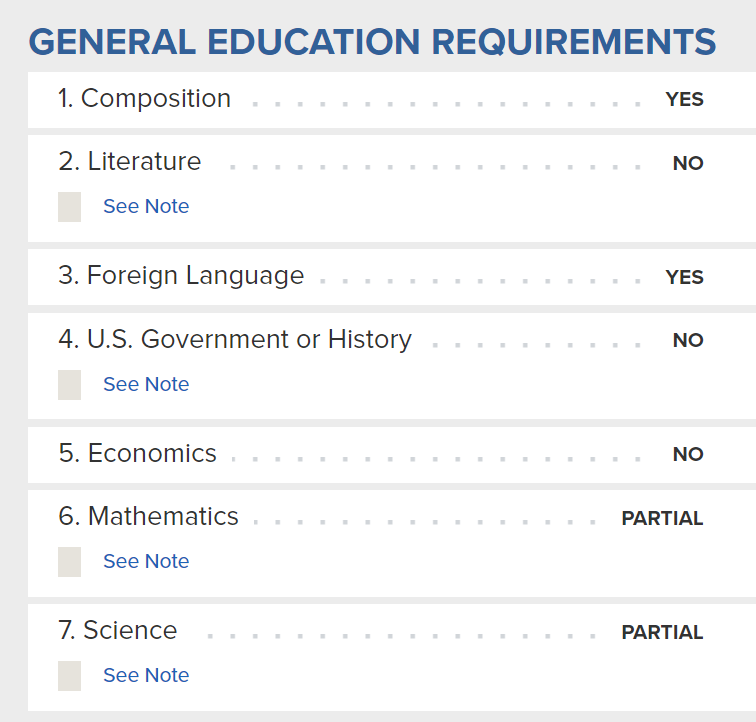 Then, the “meat” of the ACTA survey: whether or not the school requires student to take core courses (or AP out of them) in 7 specific areas of study: Composition, Literature, Foreign Language, U.S. Government or History, Economics, Mathematics, and Science. Georgetown got credit for requiring proficiency in 3 subject areas (composition, foreign language … and 1/2 credit for math and science). Based on the ACTA grading scheme, that earned Georgetown a “C” grade. A “Green Light” indicates that a school’s policies do not seriously imperil free speech. A “Yellow Light” indicates a school maintains policies that restrict a limited amount of protected expression or could too easily be used to restrict protected expression. Finally, a “Red Light” indicates that a school has at least one policy that clearly and substantially restricts freedom of speech. 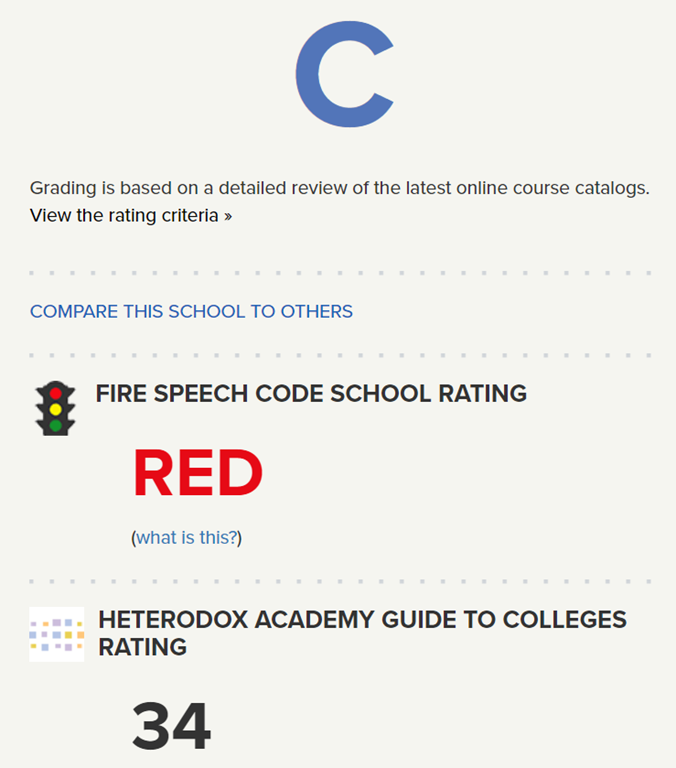 FIRE gives Georgetown a “RED Light” rating on Freedom of Speech. Heterodox Academy is a group of over 1,200 politically diverse professors and Ph.D. graduate students committed to “enhancing viewpoint diversity and the conditions that encourage free inquiry” in American higher education. Georgetown scores a 34 on the Heterodox Academy scale. I expected Georgetown to score higher, but those are the numbers. My bigger point: “What will they learn?” may be a valuable supplementary information source for students (and their parents) in the college selection process. More information beats less information every day of the week. This entry was posted on March 29, 2019 at 6:56 am and is filed under College Admissions, College life, Education - Academics. You can follow any responses to this entry through the RSS 2.0 feed. You can leave a response, or trackback from your own site.